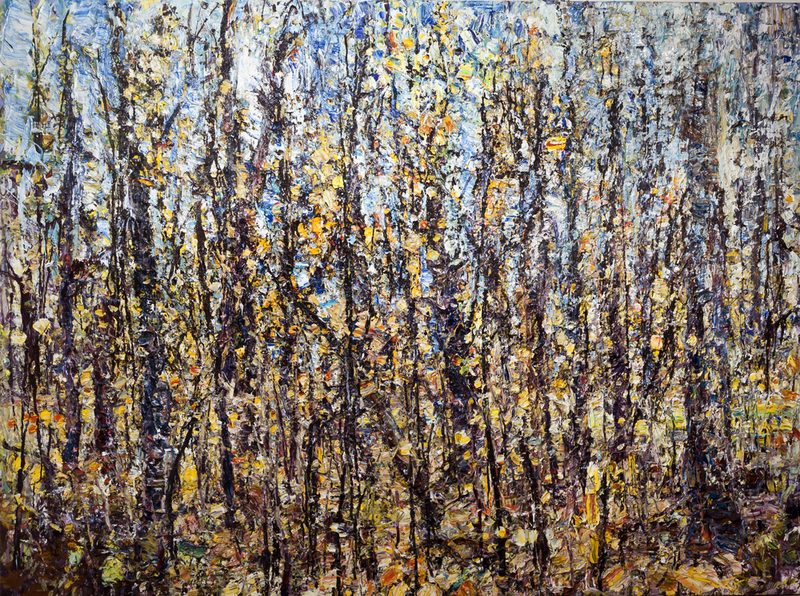 The sites of these paintings are the forests of the Niagara Escarpment, in an area I have been exploring for most of my life. I see these forests as ancient, complex and constantly transforming. They embody the eternal cycle of growth and decay. 2008 acrylic on canvas 72"x59"
2009 acrylic and collage on fiberglass 84"x120"
2010 acrylic and collage on canvas 84"x126"
2010 acrylic on canvas, 82"x108"
2011 acrylic and collage on canvas, 72"x120"
2011 acrylic and collage on plywood, 84"x120"
2010, acrylic on canvas 36"x48"
2015, acrylic on canvas . 36"x48"
2010 acrylic on canvas 24"x24"
2011, acrylic on canvas 30"x30"
2012 acrylic on canvas 30"x30"
2013, acrylic on canvas . 18"x18"
2014, acrylic on plywood 20"x20"
2017, acrylic & pastel on paper 25"x35"
2017, acrylic & pastel on paper 30"x30"